Genuine Salli Saddle Chair replacement pneumatic chair cylinders. Fits standard 50 mm (2") opening in chair base. Standard cylinders are suitable for body weights up to 260 lbs. High pressure option for body weights 230 - 330 lbs (i.e., Salli Strong). Foot control cylinders activate both top and bottom (i.e., hand and foot control). We do not warrant the use of this cylinder on any product other than the one we specify here. 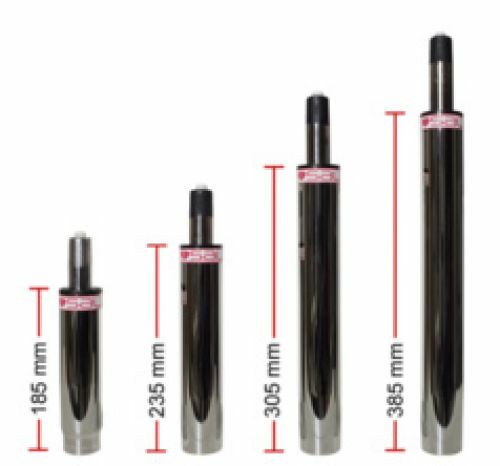 These cylinders fit many office chairs and drafting stools with a standard 17-4 top taper and 50 mm column. However, this does not mean that a chair modified using these components will be safe. For example, if you use a tall cylinder to convert a conventional office chair into a drafting stool, the added height may make the chair easy to tip over unless the chair base is replaced with a larger one. In addition, the torque forces on the cylinder and forces transferred to other chair components are different depending upon seat & backrest size and seat/back tilt adjustment. If your chair design differs from the design of the chair for which this cylinder is designed, mechanical failure and user injury could result.